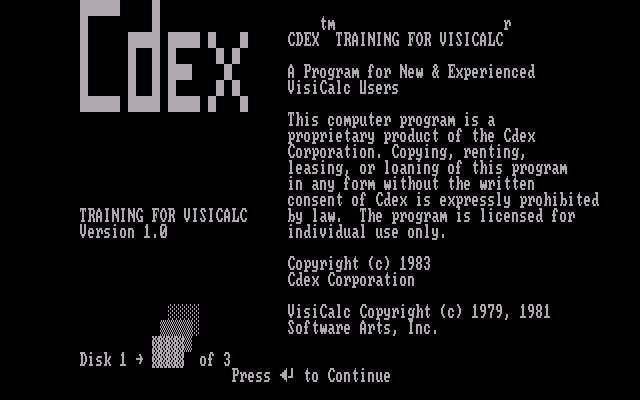 Just a brief spotlight on the Cdex Training for the VisiCalc Program: At a glance, it is just another training program, but what makes this program interesting is that it runs under the UCSD P-System for the IBM PC. Released by Cdex in 1983, this is an interactive training program that will teach you how to use VisiCalc. Cdex also sold training programs for WordStar, SuperCalc, EasyWriter ||, The IBM Personal Computer, and The Apple //e Personal Computer. There were versions for both the IBM PC and Apple II. This disk set training series is written in the UCSD P-System for the IBM PC. There were very few applications that ran under the UCSD-P System. At the moment, this is the only one that I happen to know of that has even survived. Looking at the disk format, it is easy to see why none have been dumped. The UCSD P-System uses an oddball disk format where sectors are numbered 9 through 18. And on top of that, the P-System uses its own non-DOS file system. And as if that weren't enough, these Cdex disks include copy protection. A quick look at a dump of the first few tracks shows sectors numbered 9-18 with a sector skew. These disks are formatted single-sided. The last track of the Cdex disks includes an intentionally bad sector, as well as a mis-numbered sector. The UCSD P-System for IBM PC has not been preserved anywhere that I know of. Fortunately, the first disk of this set is bootable so you do not need the origional P-System disks. The UCSD P-System on these disks has an issue similar to IBM's CP/M-86. It will fail to boot if an XT-style hard disk controller is installed. If you are using the PCE emulator to run this, you must disable any hard disk emulation. This software has been verified to run on the PCE emulator, and on clone computers without an IBM style hard drive. The images archived here include a Kryoflux, SuperCard Pro, and Transcopy image. Somewhat surprisingly, Copy II PC was also able to create functional duplicates. So if you ever wanted to try a program running under the IBM P-System, here it is. Very interesting idea for 1983. I can see why this program was made. 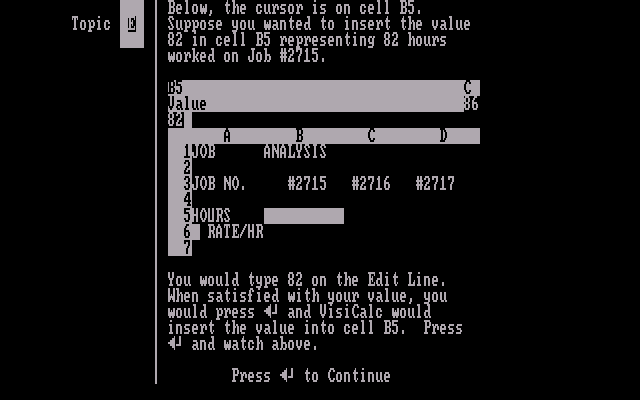 VisiCalc was popular at the time and, of course, some people did not know how to use it. :P Oh, and most of the computers VisiCalc ran on didn't have a built-in GUI like the "computers" of today. Odd that they would use UCSD Pascal for a training tool. But there is a least one other surviving UCSD Pascal program out there. There is an accounting package that is mistakenly stored as DOS hosted UCSD Pascal much to irritation of those who were looking for a clean Pecan install. Well, the allure of the UCSD P-System was much the same as Java is today. The idea was that one could write program code once and run it anywhere with few or no changes, and even a compiled bytecode binary was portable between systems. But in practice it was slower, and more cumbersome. In the IBM PC world, it quickly became a requirement that everything run under DOS, especially when hard drives became popular.